Click on the old church to see our original 2010 post and more pictures of the old building. Back in February of 2010, we took a swing through central Arkansas west of Conway. After snapping some shots of the really fine St. Boniface Church in the Dixie Community, our next stop was Houston, Arkansas where we found this old Methodist Church. Though the building was included on the National Register of Historic Places and was home to a newer congregation, it still had the appearance of a fine old building that was suffering some serious lack of attention. That’s the way it is with a lot of older churches. Churches lend themselves to be reused for little other than another church. Many of these are start-ups or young congregations with few resources to fix things, so the downhill clock ticks on. Be sure and take a look at our St. Boniface pictures. This old church is the polar opposite of Houston Methodist. It is well preserved and considered by many to be one of the premier “things-you-really-oughta-see” here in Arkansas. See several exterior and interior pictures of the old church on the Photo of the Week Page at Corndancer dot-com. You can also read a few pearls of information on the interesting history of the vintage 1906 church. You will definitely be glad you made the trip. Promise! Thanks for dropping by and sharing our swing through the hinterlands. See you next week. Sister Shoveler decides it is time just arriving to check on the boys. A second or two later, she completed her landing and was swimming with the gaggle of fellow travelers. I had an itch to shoot and headed to Saracen Lake which is normally good for a favorable snap or two. My expectations were to stroll around the lake hiking trail and shoot a few grebe and pelican pictures. To my great delight upon arrival at the lake, there were hundreds and hundreds of Northern Shoveler ducks plying the waters in search of food. Click on the ducks to see even more ducks. Cool stuff at Corndancer. 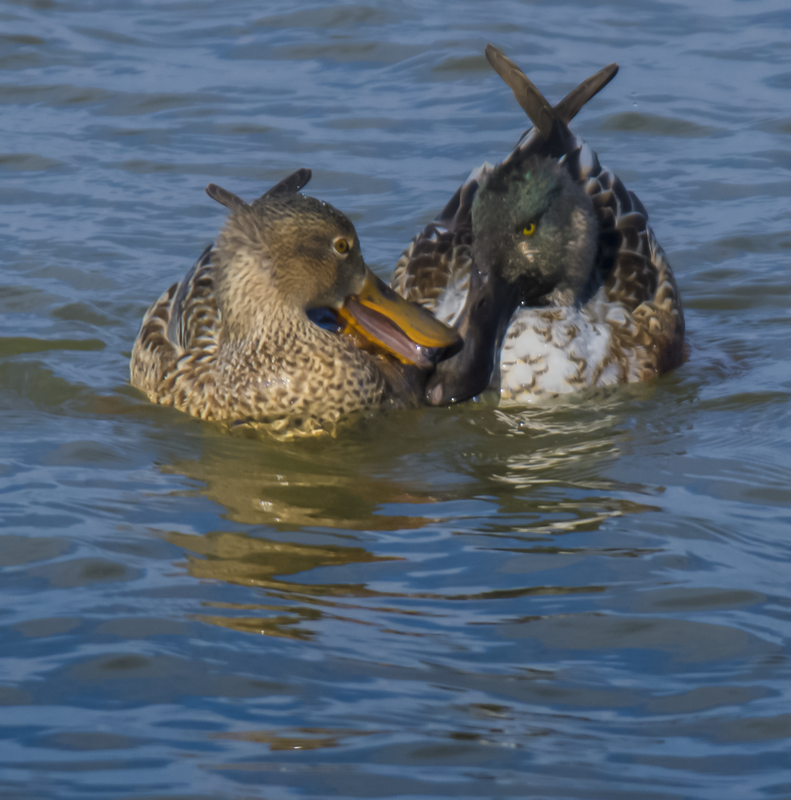 These ducks get their moniker from their large, spade-like bills. Their diet is aquatic invertebrates and small plant matter. The shovel bill makes it easy to consist on that diet. When feeding, they swim with the biggest part of their beaks submerged. 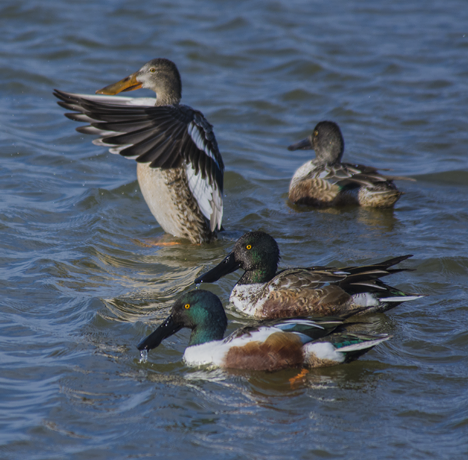 Before we go much further we encourage you to take a look at the Photo of the Week page at Corndancer dot-com where you will see more shoveler duck pictures and get in on the start of this story. We’ll wait here while you look. Ms. Duck sez to Mr. Duck, back off boy. Get out of my face or I will do some serious damage to yours. These ducks were closer to the shore than usual, so dismounting from the venerable almost-nearly-300,000-mile-pickup was inadvisable. Critters will accept the truck well as long as you stay inside. They spook in a heartbeat when the door opens. This means balancing the long lens on a partially opened window, sometimes a contortionist practice. One can hear the snap, crackle and pop of aging joints in the process. 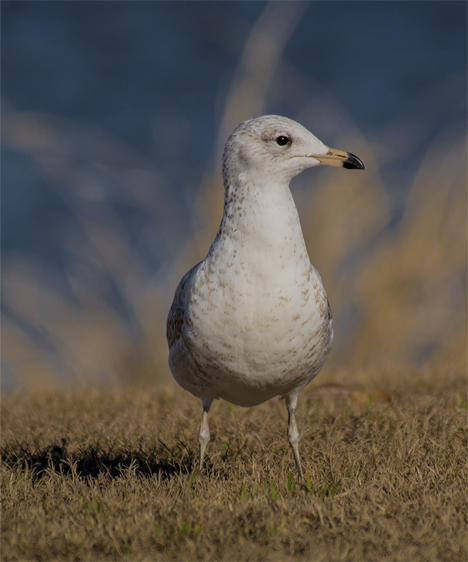 When the Arkansas River opened for navigation in the sixties, gulls followed towboats up river from south Louisiana. A few decided to stay so we have a year-round gull population. This one is Wilbur T. Gull, long-lost brother-in-law to Jonathan. While I was maneuvering on the parking lot for a better duck angle, Wilbur presented himself to be photographed. Far be it from me to refuse his request. 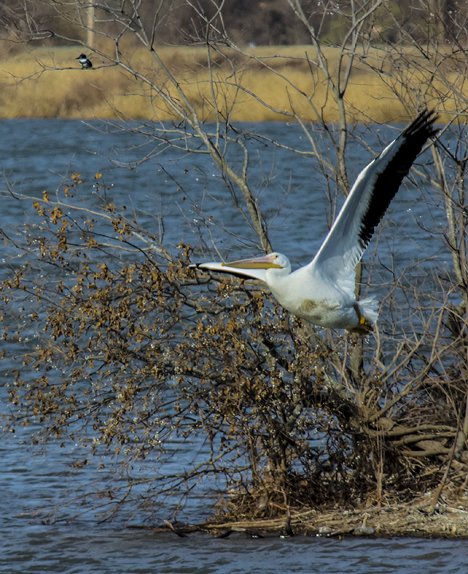 When I finished the maneuver, I noticed a big pelican taking wing. I swung the lens around and got lucky. I realized I was even luckier after opening the file and seeing the kingfisher in the tree to the upper left. Once I was in place, increasing park traffic spooked the ducks. 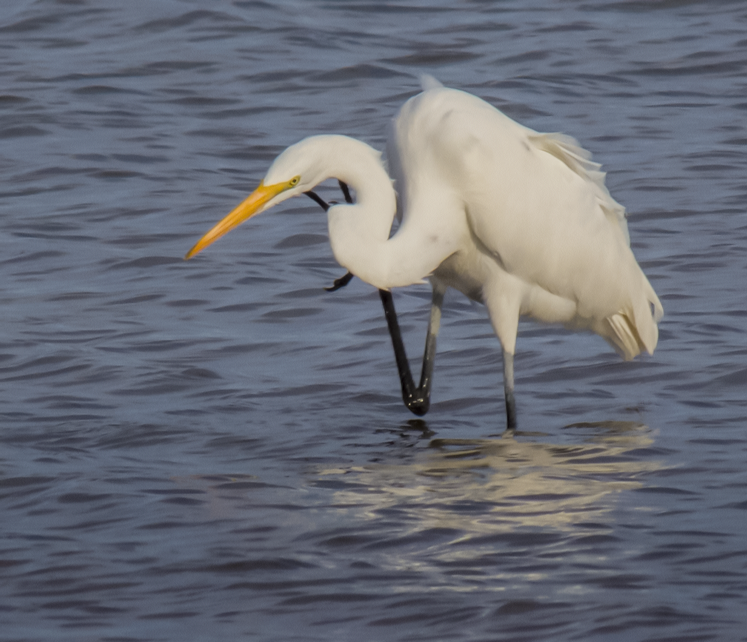 I went to nearby Lake Langhofer where I spotted this egret who seemed to say, “Well, a body just has to scratch every now and then. OK? I returned to Saracen Lake for more shovelers, but they had scattered like a covey of quail. But, there were a few of these little ducks near the shore diving, surfacing, diving surfacing – repeat if necessary. I’m not sure of their species, but on the cute scale, they well qualify for inclusion in this epistle. You have to shoot fast. It almost looks like they stay below water longer on it. 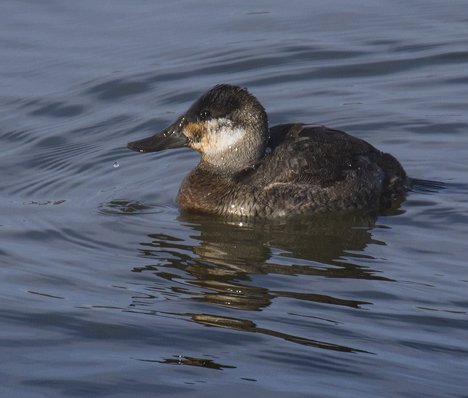 01-19-15 update: My friend David Brown has identified this critter as a female Ruddy Duck. Thanks David! Thanks for dropping by and sharing the ducky-get-lucky trip to the lake. See you next week. 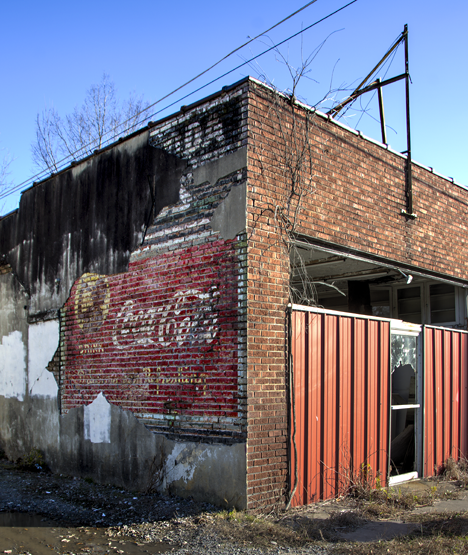 Last week, we left you in an alley between 11th and 12th Avenues on Cherry Street in Pine Bluff, Arkansas taking a gander at a partially uncovered plastered-over Coca-Cola sign on the side of a long-since vacant building once known as Cherry Street Drugs. This week, we are dragging you back to the same spot to observe completion of the job. 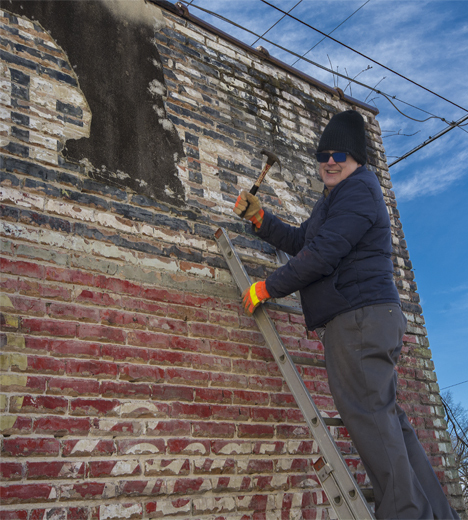 Paul Perdue, a certifiable history aficionado, discovered the old sign and put out a call for volunteers January 2, 2015 to join him the next day to remove the rest of the plaster. The volunteers came and in southern parlance, “got shed of ‘bout sixty – sebbenty-pucent” of the plaster. See a full size picture of Tommie Wright, son of the artist who painted the sign. Click the pic and go. At the conclusion of those efforts, the group agreed to reassemble — same time, same station — the following week, to complete their noble task. At this point, we steer you to the Photo of the Week Page at Corndancer dot-com to see nine other pictures and other information from the activities of the day. We’ll wait here while you look. We join the volunteer plaster chipping crew for this, the one-week anniversary of their original get-together. The original group was ringleader Perdue, joined by Alan Smithey, Kelly Murphy, and Mike Webb. They were joined the second Saturday by Skip Tucker, another gracious volunteer, and Tommie Wright, son of the artist who painted the sign in 1947. 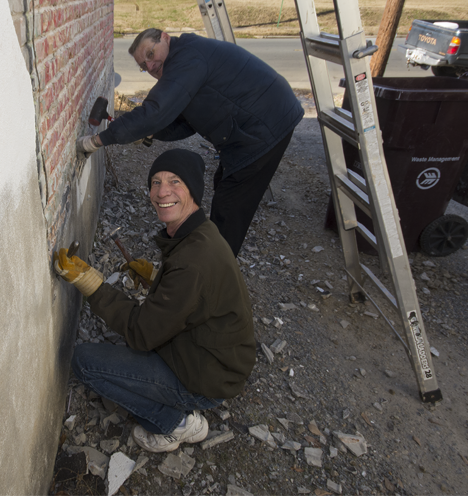 Front to back: Skip Tucker and Alan Smithey happily chip away the the plaster covering the bottom of the sign, despite bone-chilling conditions. The weather was 32° F with a substantially lower wind chill factor. Despite these less-than-ideal, teeth-chattering conditions for outdoor volunteer work, they “licked in” to the job and completed the task of uncovering the sign in a couple of hours. Left to right, Alan Smithey and Kelly Murphy are chilly chippers as they bang away at the covering plaster. A second view of Kelly and Alan at work with a better view of the sign. 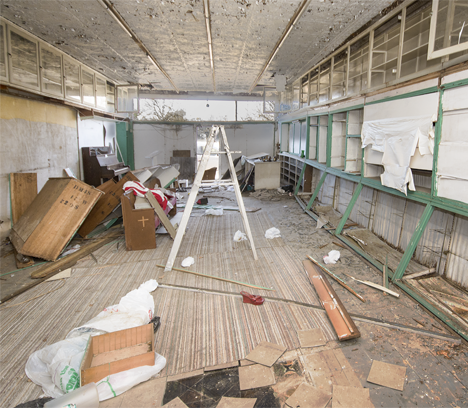 As the chippers chipped away, the siren call of the inside of the long vacant drug store was too much to resist and I entered the premises through a broken out front door. Somehow, you just don’t expect to find a piano in a vacant drug store, but there it was, just bigger’n’ Dallas. Perchance some souls established a church in the old structure after the drug store egress. 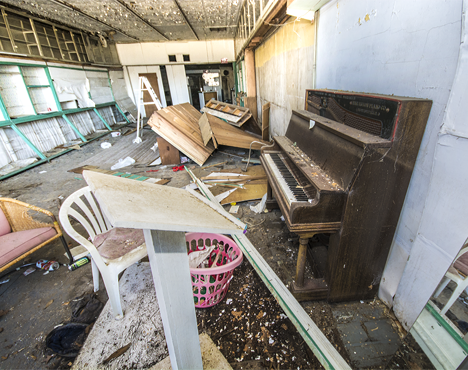 The last things you expect to see in an abandoned drug store are a makeshift pulpit and an old piano. It makes one suspect that someone may have declared his or her self a preacher and attempted to start a church in the old building. The next picture confirms our suspicions. Looks like a church pew under some of the overturned shelving. 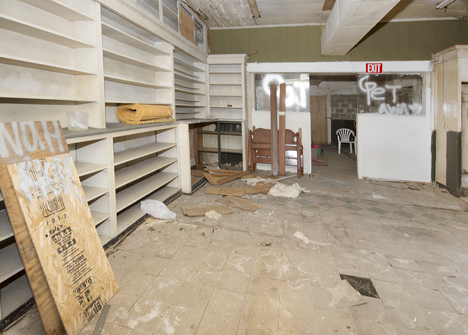 Either the last service got a bit out of hand or ransacking hobbyists came later and made the old drug store/church the object of their affection. Paul Perdue, instigator of the project and ringleader of the crew makes a healthy swing at the plaster with a smile. Mike Webb takes a swing at the last remaining plaster contamination. Mike Webb, a congenial volunteer gives the camera his best smile in bone-chilling weather. These volunteers are not clamoring for attention, pay, or praise. They did what they did because they believe it is the right thing to do. Granted they appear to have some historic appreciation genetic materials circulating in their persons, but that is a good thing. Few will argue that lessons from the past are well-placed in civilized society. Most will agree that these lessons make society more civil — and Lord knows we need more civility — even if it comes from an old sign. Watch for our newest post coming around 9:30 p.m. CST tonight. 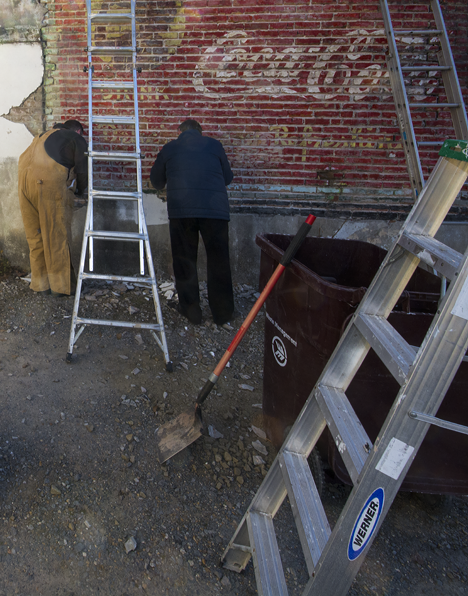 We’ll show you how the crew completes uncovering the old sign. 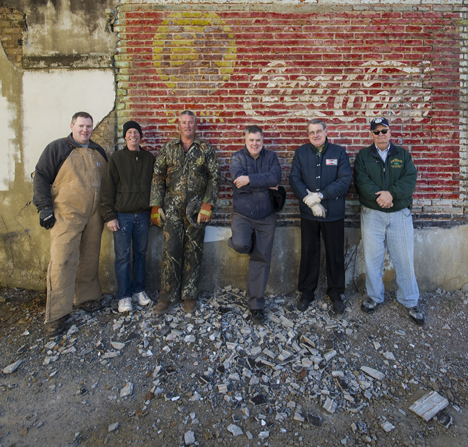 Volunteers have partially removed cement plaster covering this 1947 Coca-Cola building sign on a vacant store in Pine Bluff, Arkansas. 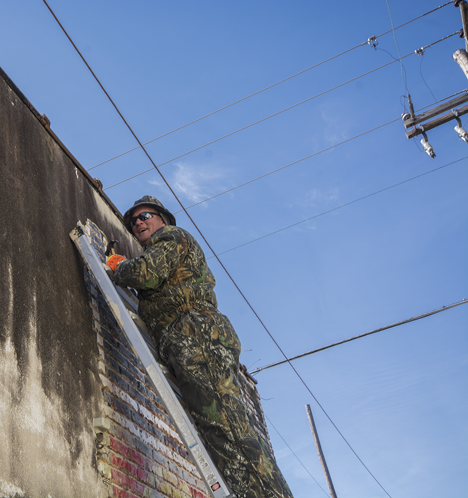 For Paul Perdue of Dallas TX, a Pine Bluff, Arkansas native and a near-rabid history buff, the thought of ugly concrete plaster covering a hand-painted Coca-Cola wall sign completed in the late forties in his home town was absolutely, positively too much to bear any longer. He took matters in his own hands. Literally. Click on the sign to see more pictures including the artists signature. 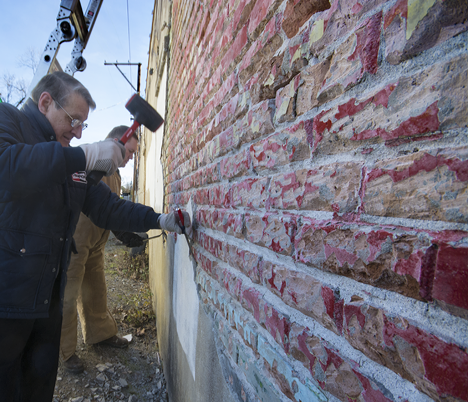 January 2, 2015, he wheeled up to the site and started chipping chunks of plaster from the underlying sign with his hot little hands. To his delight, the plaster, for the most part, did not pull the paint away from the bricks upon which the artist plied his brush. A corner of the sign was showing nicely. Satisfied that it was possible to remove the plaster and let the sign see the light of day one more time, Perdue went to Facebook (he’s a Facebook aficionado extraordinaire) and explained what he wanted to do and asked for volunteers to help in the task. 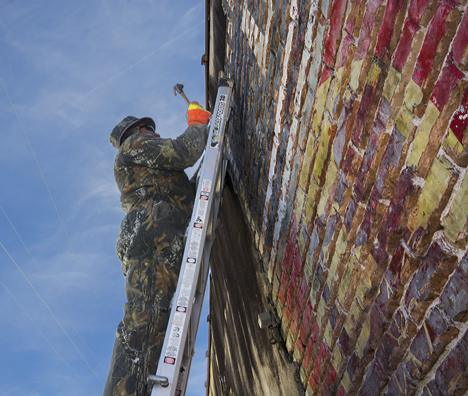 You can see more of the wall and a close-up of the sign artist’s signature emblazoned on his work on the Photo of the Week page at Corndancer dot-com. We’ll wait while you look. The next day, volunteers showed up with scrapers and flat blade screwdrivers in hand. In a tad more than fours hours, in very cold weather, they had removed 60% or so of the offending plaster. They tell us they will return next weekend and complete their scraping and chipping. Lord willin’ and the creek don’t rise, we plan to be there and record a bit of the work. Not far from the old drug store wall is a building I have meant to shoot for a long time. The old structure in its new permutation looks like it would be more at home in South Louisiana or on one of the Caribbean Islands. 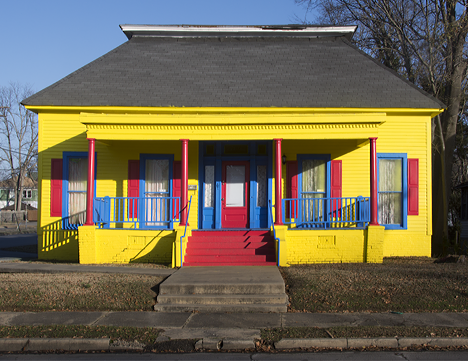 In a former life, this old building in Pine Bluff, Arkansas was a family residence and later, home to an architectural group, and then to a real estate company. Now it is a day care center and does a bang-up job of brightening its corner of the world. We are a bit short on content this week, which means you waste less time reading this offering. Be thankful for this and other blessings.